Donald Trump’s “rigged election” claims are literally insane. It would be literally insane to try to steal an election in the way Donald Trump is alleging. 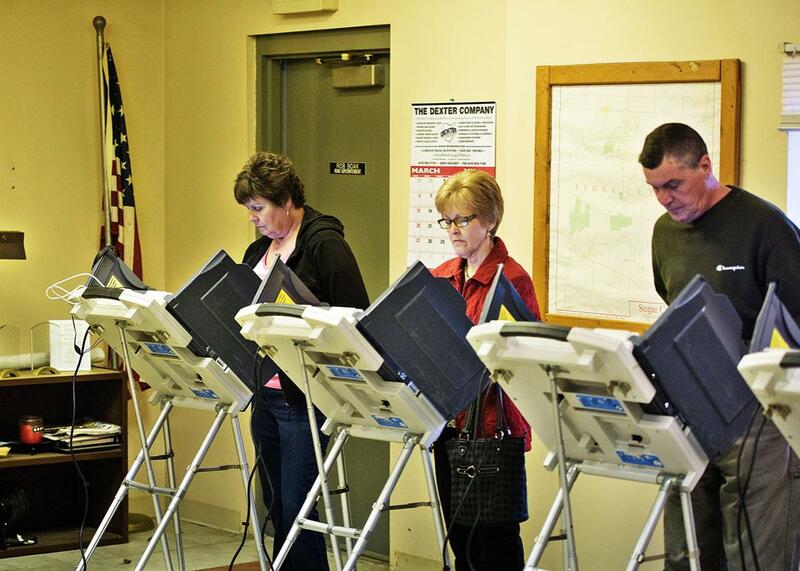 People use electronic machines to vote on March 15 in Beach City, Ohio. In recent days, Donald Trump has been aggressively pushing the idea that the election is about to be stolen from him through voter fraud and dirty tricks. The Republican candidate, though, has not been a paragon of clarity when it comes to how the election is being rigged against him—Monday morning he tweeted that Hillary Clinton allegedly being fed questions before a Democratic primary debate was a kind of “voter fraud!” Here’s what we know, though, about what he’s said and why his claims that the election is being stolen have no basis whatsoever in reality. When he’s been most specific, Trump has said that voters in “certain areas”—which his surrogate Rudy Giuliani confirmed to CNN’s Jake Tapper means inner cities where there are large numbers of people of color—would be voting five, 10, or even 15 times in states such as Pennsylvania. Trump has urged his almost entirely white supporters not only to watch their own polling stations, but to go to other polling stations looking for fraud in these areas made up mostly of black and Hispanic voters. To begin with, this idea of massive Democratic fraud is not new—Slate readers may remember my 2007 piece on the “fraudulent fraud squad” of Republican Party hucksters pushing these claims. It has happened again since then. The truth is, though, that not only does zero evidence exist that this sort of fraud has taken place on any regular basis, but multiple voting simply cannot happen in any practical sense on a scale to influence a presidential election. To vote five, 10, or 15 times one would have to either register five, 10, or 15 times in different jurisdictions or with false names or go five, 10, or 15 times to polling places claiming to be someone else whose name is on the voter rolls, in the hopes that this person has not already voted and you would not get caught. And to do this on a scale for a presidential election, in a place such as Pennsylvania with millions of voters, you would need to pay tens of thousands of people, all without any way of verifying how they voted. What a stupid way to try to steal an election! That’s why in preparing my 2012 book, The Voting Wars, I could not find a single instance anywhere in the U.S. from the 1980s onward where massive impersonation fraud was used to try to steal an election. The only recent instance I’m aware of concerning such multiple voting concerned a staunch supporter of Republican Wisconsin Gov. Scott Walker and other Wisconsin Republicans. This man registered and voted about a dozen times in a few elections in multiple jurisdictions. He was caught and literally pleaded insanity, because such a plan is literally insane. That’s not to say voter fraud is nonexistent. We do see occasional fraud with absentee ballots. Usually that involves vote-buying, where someone is paid to vote a certain way or someone steals someone else’s blank absentee ballot mailed from election officials and casts that ballot for a preferred candidate. But Pennsylvania does not have no-excuse absentee balloting, and the scale of trying to steal a presidential election with requested absentee ballots in a state where Trump is behind in polls by 6 to 9 percentage points would be quite easy to detect. Nor is it possible to simply hack into computers and change vote totals. I don’t like our decentralized voting system, but one advantage of voting in more than 10,000 different electoral jurisdictions is that there’s no central computer counting all the votes. In most places there is also a paper record of votes. In places like the parts of Pennsylvania that use electronic voting machines without paper trails, there is a cause for concern. But those machines are not centrally linked over the internet. (Still, in the name of public confidence, they should be junked as soon as possible and replaced with machines that allow a paper recount.) The apparent Russian hacks into voting systems, meanwhile, have been to steal lists of voters, not to manipulate vote-counting machines. The purpose of those hacks appears to be to cast doubt on the legitimacy of the elections—another area where Putin’s and Trump’s interests align—not to change actual totals. None of this of course will convince die-hard Trump supporters and some Republican voters who have been primed to believe Democrats are regularly stealing elections. I hope they won’t get violent or intimidate voters on Election Day, as is seeming increasingly—and frighteningly—likely. For those of us living on planet Earth, we should dismiss Trump’s claims of vote-rigging as the rantings of someone who is either too stupid to know how voting works or too disingenuous to tell the truth.